Jon Jones vs. Glover Teixeira Fight Announcement: Take Four. After confirming the light heavyweights would battle on three previous UFC cards, only to postpone the matchup on each occasion, Jones will now defend his crown against Teixeira at UFC 172. Most recently, the 205-pounders were slated to headline UFC 171, but the March 15 show received an unexpected boost Friday when it was reported Johny Hendricks and Robbie Lawler would battle for Georges St-Pierre’s newly-vacated welterweight title that night. With two current champs sidelined for much of 2014 – Cain Velasquez (shoulder) and Anthony Pettis (knee) – it made no sense to have two championship affairs on the same show. UFC president Dana White confirmed the chance this afternoon via Twitter. No word on when and where UFC 172 will go down. The UFC admittedly jumped the gun in October when they prematurely reported Jones would defend his light heavyweight belt against Teixeira at UFC 169, only to postpone the Super Bowl Saturday scrap four days later. The 205-pounders were then slated to meet at UFC 170, but that was nixed than 24 hours later. 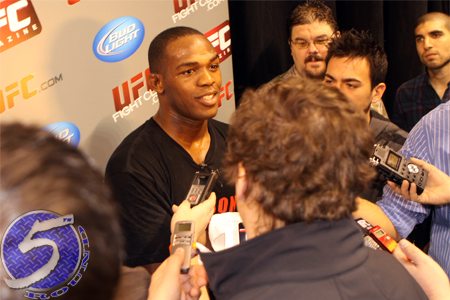 At just 26 years of age, Jones became the most decorated UFC light heavyweight champion at UFC 165 by posting his sixth straight title defense. He’s beaten the who’s who of the division, including five former UFC title holders en route to dominating the throne. Teixeira earned his next dibs status with a TKO victory over Ryan Bader in September. The slugger has rattled off 20 consecutive wins, with his last five coming inside the Octagon. He’s recorded finishes in four of his UFC outings, three of which came in the opening round.